A moment in my day is the topic for today's blogging challenge. For me that would be the special time I have with my partner before we both go off to work in the morning. We usually wake up earlier so we can have breakfast in bed together but some days, I get up and make my partner's favourite breakfast. 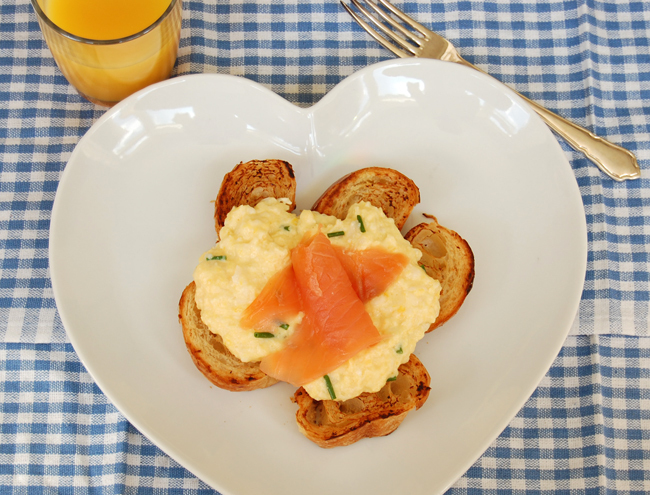 I thought I would share with you my scrambled egg recipe, it really does taste divine! With the smoked salmon on the top, it makes it a bit more decadent. Melt one knob of butter in a non-stick pan, not letting it brown. Whilst the butter melts cut the ends off the croissants then cut them into slices about 3/4 of an inch thick. Toast them on a dry frying pan for about a minute each side then lay them on two plates. Break the eggs into the pan and break up the yolks with a quick stir using a wooden spatula. Keeping to a medium heat, let the eggs start to bubble. Remove from the heat and push them around the pan to let all the eggs touch the bottom. Bring the pan back to the heat until the eggs solidify a little more. Remove from the heat and stir again. Keep doing this until the eggs look like curds. They do not want to set hard. Just before the eggs are cooked, remove from the heat add another other knob of butter, salt and pepper and the double cream . Return to the heat again and tease the eggs until the butter is melted. Remove from the heat, fold in the chives and then serve on the croissants. Lay the smoked salmon on top of the eggs and serve. Try them and let me know what you think. You could substitute creme fraiche for the double cream for a lighter touch, but this is about having a luxurious treat. I believe I may have got this recipe from a book by Gordon Ramsay that my mum had. Are these the best scrambled eggs in the world? Probably. They are so yummy, Alesha. You have to try them. That looks divine - and on croissants too - I'd never have thought of that. The croissants just add that extra delicious taste! So easy to do as well. Oh my, I love smoked salmon and eggs together. This looks wonderful. It tastes so good, Gwen. What a sweet (and yummy!) tradition. Sometimes I think I'd like to do that, but my husband is NOT a morning person. Not even close sadly. For me it's a relaxing way to start the day but I always need a strong, freshly brewed coffee to get me going in a morning. It's a chilled way to start the day. You have to try it, it's so tasty and so quick and easy to do.